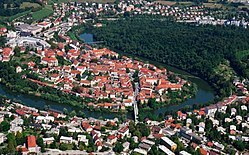 Novo Mesto (pronounced [ˈnɔːʋɔ ˈmeːstɔ] ( listen); Slovene: Novo mesto; also known by other alternative names) is the city on a bend of the Krka River in the City Municipality of Novo Mesto in southeastern Slovenia, close to the border with Croatia. The town is traditionally considered the economic and cultural centre of the historical Lower Carniola region. Novo Mesto was attested in historical sources in 1365 as Růdolfswerde (and as Rudolfswerd in 1392 and Noua Mesta in 1472). The German name (spelled Rudolfswerth in the modern era) is a compound of the personal name Rudolf and wert 'island, peninsula, land above the water', and refers to Rudolf IV, Duke of Austria, who conferred town rights upon the settlement in 1365. The parallel German name Neustadtl was also in use (attested as Newestat in 1365, and probably a translation of the Slovene name). The name used for the settlement before 1365 is unknown. The Slovene name Novo mesto literally means 'new town'; names like this are common in Europe and generally refer to settlements built at a site where an older one was burned or otherwise destroyed. From 1865 to 1918, the town was officially named Rudolfovo in Slovene, based on the German name. Following World War I and the dissolution of Austria-Hungary, the city became part of the Kingdom of Yugoslavia and was officially renamed Novo mesto. Novo Mesto has been settled since pre-history. The city is one of the most important archeological sites of the Hallstatt culture (Early Iron Age) in Europe and has been nicknamed the "City of Situlas" after numerous situlas found in the area. Graben Castle down the Krka River, ancestral seat of the noble House of Graben von Stein, was first mentioned in an 1170 deed. The town itself was founded by the Habsburg archduke Rudolf IV of Austria on 7 April 1365 as Rudolfswerth. The Austrian Habsburgs received the Carniolan March from the hands of Emperor Louis IV in 1335 and in 1364 Rudolf "the Founder" proclaimed himself a Duke of Carniola. During World War II the city was controlled by Fascist Italy as part of the Province of Ljubljana until Mussolini's downfall in 1943. It was then occupied by Nazi Germany until the end of the war. In 1958, the authorities of the Socialist Federal Republic of Yugoslavia had a motorway built connecting the Slovenian capital Ljubljana and Zagreb in Croatia, which passed through Novo Mesto. The A2 motorway is today part of the European route E70. With its construction, Novo Mesto became much better connected to the rest of Slovenia and the rest of Yugoslavia, and began to grow as an important regional center. The population of Novo Mesto is predominantly ethnically Slovene. On the southeast outskirts of the town there is a Roma settlement called Žabjak, also known as Brezje. Novo Mesto features a humid continental climate. Winters are moderately cold with snow cover every winter. The highest snow depth was recorded on 17 February 1969 with 103 cm. The coldest temperature of -25.6 ºC was recorded on 17 February 1952 while highest, 39.9 ºC on 8 August 2013. Precipitation is relatively high with most rain in early summer and early autumn. The driest month is January with 53 mm. The wettest year on record was 2014 with 1482 mm of precipitation while the driest was 2000 with 827 mm. Novo Mesto has been a hub of artistic creation in various fields: music, literature, and visual arts. The turning point is the September 1920 exhibition named Novo Mesto Spring, which brought together artists of different genres and marks the beginning of avant-garde art in Slovenia. The development of music in Novo Mesto may be traced to the 16th century, with the clergy, e.g. the provost Jurij Slatkonja, the first residential Bishop of Vienna, promulgating the development of vocal music. Accelerated development took place in the 19th century with the establishment of a brass band in 1846, and the establishment of the Lower Carniola Singing Society in 1884. The society laid the foundations of the vocal music in the wider Lower Carniola area. A significant part in the musical development of the town was contributed by students and the teaching staff of the Novo Mesto Grammar School. The school had a quality singing choir led by Hugolin Sattner, Aleš Ottokar and Ignacij Hladnik as well as a student orchestra led by Viktor Parma. In 1886, a male choir was established in the town in the frame of the Catholic Craftsman Assistants Society. Several classical composers were connected to Novo Mesto, the best known of them being Marjan Kozina, after whom the music school of the town is named, and the expressionist composer Marij Kogoj. In the 20th century, particularly after World War II, a number of influential contemporary (jazz, rock, and pop) music groups appeared and created in the town, the most notable of them being Rudolfovo, Dan D and others. In the early 21st century, the most popular pop-rock music group was Dan D, whereas classical music gained two important pieces of work in the frame of the Jurij Slatkonja Vocal Academy, a chamber opera (The Baptism on the Savica) and Te Deum, a monumental cantata work. The central literature personalities of Novo Mesto are the writer Janez Trdina (1830–1905), the poet Dragotin Kette (1876–1899), and the poet and essayist Anton Podbevšek (1898–1981). Trdina, after whom the central cultural venue of the town is named Janez Trdina Cultural Centre, lived in Novo Mesto in exile and wrote primarily short fictional stories about the Gorjanci hill range, which he published under the title Fairytales and Stories about Gorjanci (Bajke in povesti o Gorjancih). Kette, who lived in Novo Mesto in the time of his studies, wrote lyrical poetry, particularly dedicated to Angela Smola whom he met in the town's chapter church. Podbevšek laid the foundations of Slovene lyrical avant-garde poetry. The youngest professional theatre in Slovenia and the first theatre in the town, established in 2005, has been named after him Anton Podbevšek Theatre. Novo Mesto is the birthplace of the painter and graphic artist Božidar Jakac (1899–1989), who produced one of the most extensive oeuvres of visual arts in Slovenia and was a key organiser of visual arts education and visual arts events in the country. Many of his works as well as of other well-known Slovenian artists are kept at the Jakac House in the town. Other known Novo Mesto visual artists were the painter Vladimir Lamut and the architect Marjan Mušič. Several notable film artists originate from Novo Mesto, besides Jakac also the film editor Jurij Moškon, and the contemporary film directors Rok Biček, Klemen Dvornik, Nejc Gazvoda, and Žiga Virc. 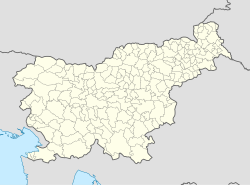 On 7 April 2006 Novo Mesto became the seat for the Roman Catholic Diocese of Novo Mesto, which is a suffragan of the Archdiocese of Ljubljana. Novo Mesto Cathedral, standing on Kapitelj Hill above the town, is dedicated to Saint Nicholas and is an originally Gothic building that was rebuilt in the Baroque style in the 17th century. An oil painting by Tintoretto and altar images by the French 18th century painter Valentin Metzinger , the leading Baroque painter in Slovenia, are on display in the church. ^ a b "Data on the selected settlement: Novo Mesto (City Municipality of Novo Mesto)". Statistical Office of the Republic of Slovenia. Retrieved 23 May 2012. ^ a b c d Snoj, Marko. 2009. Etimološki slovar slovenskih zemljepisnih imen. Ljubljana: Modrijan and Založba ZRC, p. 284. ^ Savnik, Roman, ed. 1971. Krajevni leksikon Slovenije, vol. 2. Ljubljana: Državna založba Slovenije, p. 516. ^ "Poštarji nočejo v romsko naselje". Zurnal24.si. 31 May 2016. Retrieved 21 October 2017. ^ "Po Dobruški vasi še Žabjak in ostala naselja?". Dolenjski list. 20 September 2016. Retrieved 21 October 2017. ^ Stanković, Dragana; Škerl Kramberger, Uroš (14 June 2016). "Za romsko naselje Žabjak na razpisu zmanjkalo denarja, novomeški župan napovedal upravni spor". Dnevnik. Retrieved 21 October 2017. ^ Popisi prebivalstva 1948-2011 [Population Census 1948-2011, 2003] (in Slovenian). Statistical Office of the Republic of Slovenia. 2013. ^ "Climate normals 1981–2010" (PDF). ARSO. Retrieved 3 November 2017. ^ "Extreme values of measured yearly, monthly and daily values of chosen meteorological parameters in 1951–2014". ARSO. Retrieved 3 November 2017. ^ "494: Novo mesto - Cerkev sv. Nikolaja" [494: Novo Mesto – St. Nicholas' Church]. Register nepremične kulturne dediščine [Registry of Immovable Cultural Heritage] (in Slovenian). Ministry of Culture, Republic of Slovenia. Retrieved 23 May 2012. ^ "Miasta bliźniacze Torunia" [Toruń's twin towns]. Urząd Miasta Torunia [City of Toruń Council] (in Polish). Retrieved 22 August 2013. Wikimedia Commons has media related to Novo Mesto. This page was last edited on 2 April 2019, at 17:32 (UTC).